Hiring? 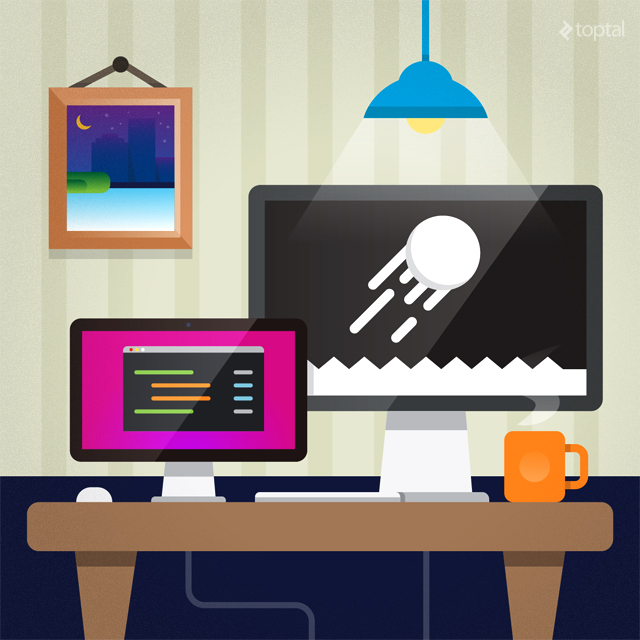 Toptal handpicks top game developers to suit your needs. Among all the programming languages I have worked with so far, Processing was without a doubt one of the most entertaining ones. It is a straightforward language - easy to learn, understand and use, yet it is very powerful. It is almost like you are painting on an empty canvas with lines of code. There are no rigid rules or guidelines whatsoever to limit your creativity, the only limit is your imagination. To understand and easily follow these articles, you should have a basic knowledge of programming, as I will not be talking about programming fundamentals. I will mostly not be touching any advanced programming concepts though, so a superficial understanding will do. There are some parts where I talk about some low level ideas and concepts such as object-oriented programming (OOP), but they are not crucial. Those are for curious readers who are interested in the structure of the language. If you don’t want to know, you can just skip those parts. Other than that, the only thing you should have is the ambition to learn this awesome language and enthusiasm to create your own game! I’m always in favor of learning programming by trying and experimenting. The sooner you dive into your own game, the faster you’ll get comfortable with Processing. So that will be my first suggestion, try each and every step in your own environment. Processing has a simple and easy to use IDE (i.e. a code editor), it is the only thing you’ll need to download & install to follow. You can download it from here. This section includes a brief technical overview of the language, its structure and some notes on the compilation and execution process. The details will include some advanced knowledge on programming and the Java environment. If you don’t mind about details for now and can’t wait to learn and code your own game, you can skip to the “Fundamentals of Processing” section. You can see that the processing code block was wrapped with a class that extends from Java’s PApplet. Therefore, all the classes you define in your processing code, if any, will be treated as inner classes. The fact that Processing is Java based gives us a lot of advantages, especially if you are a Java developer. Not only is the syntax familiar, but it also gives you the ability to do things like embedding Java code, libraries, JAR files in your sketches, using your Processing applets directly in your Java applications, defining classes and using standard data types such as int, float, char and so on. You can even write your Pocessing code directly from Eclipse, if you want to spend some time to set it up. One thing you can’t do is use AWT or Swing components in your Processing sketches, because they conflict with the looping nature of Processing. But don’t worry, we will not be doing any of that fancy stuff in this article. If you have read until this point and still didn’t download the Processing IDE, please go ahead and do it. Throughout the article, I will outline some easy tasks for you to try on your own, you can only practice if you have the IDE up and running. 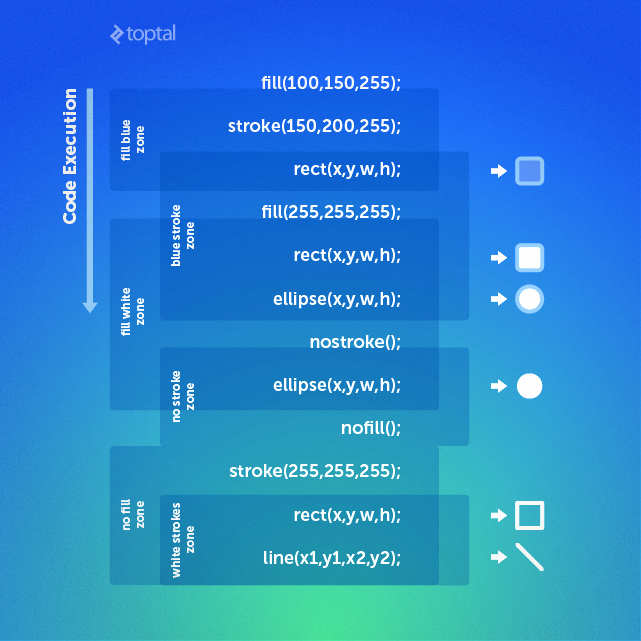 Here is a brief introduction of the processing IDE. It is very simple and self explanatory, so I will keep it short. As you’d expect, run and stop buttons do what they suggest. When you click on the run button, your code will get compiled and executed. By nature, processing programs never get terminated, they run forever and ever until they get disturbed. You can terminate it programmatically, however if you don’t, you can use the stop button. The window on the code editor is where your sketches normally run. In the image it is blank, because we haven’t set any property like size or background color, or we didn’t draw anything. 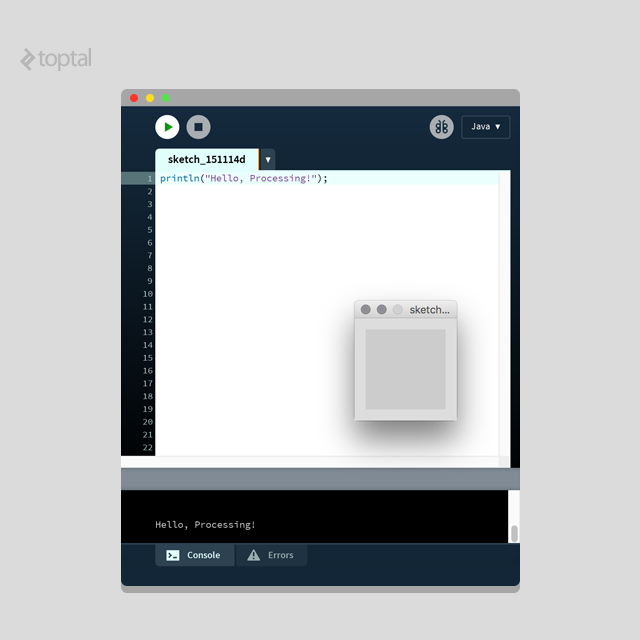 There is nothing much to talk about the code editor, it is simply where you write your code. There are line numbers(!) Older versions of Processing didn’t have that and you can’t imagine how happy I was when I first saw them. The black box below is the console. We will use it to print out stuff for quick debugging purposes. The errors tab next to the console is where your errors will appear. This is also a new useful feature that came with Processing 3.0. In the older versions, the errors were printed to the console and it was hard to keep track of them. As stated before, setup blocks get executed once when the program starts. You can use it for making configurations and for things that you’d like to run only once, for instance, loading images or sounds. Here is an example setup block. Run this code in your own environment and see the results for yourself. If you use it without any parameters, your processing sketch will simply run in fullscreen, and will run on your main display. The ‘display’ parameter is used to set on which display your sketch will run. For example if you connect external monitors to your computer, you can set the display variable to 2 (or 3, 4 etc.) and your sketch will run there. The ‘renderer’ parameter is as explained at the size() part above. This is another feature that is introduced with the new release of Processing. It is a code block, just like setup and draw. It is useful when you want to define size() or fullScreen() methods with variable parameters. It is also necessary to define size() and other styling properties such as smooth() in this code block if you are using any environment other than Processing’s own IDE, such as Eclipse. But you will not be needing it in most cases, definitely not in this article. If you guessed “1 2 3 4…”, I got you! This is one of the confusions in Processing. Remember this block repeatedly gets executed? When you define a variable here, it gets defined on each loop over and over again. On each iteration, x is set to 0, gets incremented by 1 and gets printed to the console. Therefore we get the result “1 1 1 1…”. This example was somewhat obvious, but it may be confusing when things get a little complicated. You might be asking yourself, how can a variable defined outside of our blocks work? And why didn’t we use the setup() block since it gets executed once at the beginning? The answer is related with object-oriented programming and scopes, if you are not familiar, you may skip this paragraph. Refer to the part where I explained how Processing code gets converted into Java. Remember how they get wrapped with a Java class? The variables we write outside of setup() and draw() block also gets wrapped, therefore they are treated as fields of the outer class that wraps our code. Using x+=1 is the same as using this.x+=1. It also functions the same in our case, no variable called x is defined in the scope of draw() and an outer scope is searched, which is the scope of this. And why didn’t we define our variable x in the setup() section? If we did, the scope of which x is defined would be the scope of the setup function and it wouldn’t be accessible from the draw() block. point(x, y, z) - In case you are using 3 dimensions. line(x1, y1, z1, x2, y2, z2) - In case you are using 3 dimensions. 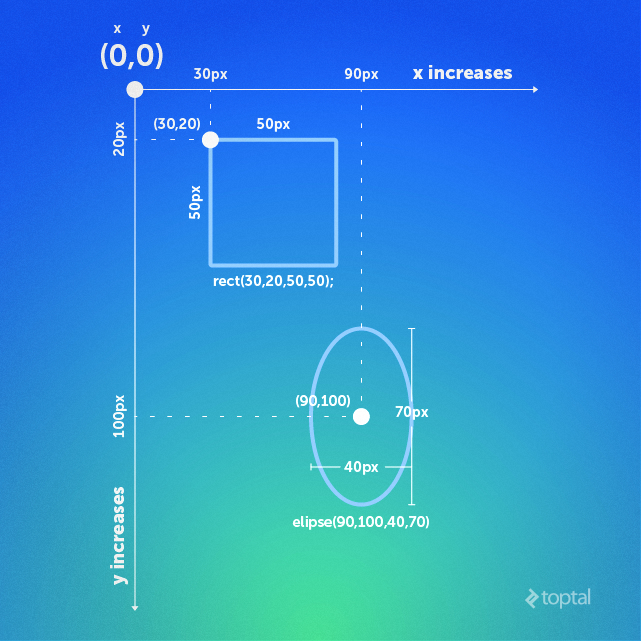 rect(x, y, w, h, r) - ‘r’ mean the radius in pixels to make the corners rounded. rect(x, y, w, h, tl, tr, br, bl) - Radius for top left, top right, bottom right, bottom left corners respectively. This is also in pixels. arc(x, y, w, h, start, stop) - ‘start’ and ‘stop’ is used to determine the angle to start and stop drawing the arc. Values are in radians. Constants such as “PI, HALF_PI, QUARTER_PI and TWO_PI” can be used. arc(x, y, w, h, start, stop, mode) - ‘mode’ variable is to determine the rendering style of the arc (string). Available options are “OPEN, CHORD, PIE”. OPEN will leave the non-drawn parts borderless. CHORD will complete the non-drawn parts with a border. PIE will make your arc look like a pie chart. Displaying texts on the screen is similar to displaying shapes, the basic idea is that you determine a coordinate at which you want your text to be displayed. There is however more to handling texts. You will have more control over your texts after the properties & settings section, where you’ll learn how to apply settings and properties to objects. For now, I will show the basics of displaying texts. There are many ways to do it, I’ll only show the essentials. text(c, x, y) - ‘c’ means character, any alphanumeric character will be displayed. text(c, x, y, z) - In case you are working with 3 dimensions. text(str, x, y) - ‘str’ is the string to be displayed. text(str, x, y, z) - In case you are working with 3 dimensions. text(num, x, y) - ‘num’ is the numeric value to be displayed. text(num, x, y, z) - In case you are working with 3 dimensions. As you can see in the image, first line sets the fill color to red and the second line sets the stroke color to blue. We now have two active settings: fill red and blue strokes. As you’d expected, whatever our object may be on the next line, it will be filled with red and have blue strokes (if applicable). You can keep examining the image this way, and you will grasp the logic. stroke(r, g, b) - Red, green and blue values as integer. strokeWeight(x) - x is an integer and represents the width of stroke in pixels. background(r, g, b) - Red, green and blue values as integer. CORNERS: Sets the first two parameters (x and y) as the location of the top-left corner, and last two parameters (w and h) as the location of the bottom left corner of the ellipse. So this mode, “width” and “height” is irrelevant. Thinking it as ellipse(x_tl,y_tl,x_br,y_br) makes more sense in this case. CORNERS: Sets the first two parameters (x and y) as the location of the top-left corner, and last two parameters (w and h) as the location of the bottom left corner of the ellipse. So this mode, “width” and “height” is irrelevant. Thinking of it as rect(x_tl,y_tl,x_br,y_br) makes more sense in this case. textSize(size) - Integer value of the desired size. textLeading(lineheight) - Pixel value of the space between lines. textAlign(alignX, alignY) - ‘alignY’ is for vertical alignment. Available: TOP, BOTTOM, CENTER, BASELINE. My intention for letting this happen was to make you realise how the looping nature of Processing works. Refer to example at the “Draw Block” section, do you remember why we got “1 1 1…” instead of “1 2 3…” ? The same reason why the ball is leaving marks behind. Each time the draw block iterates, x and y gets incremented by 5 and therefore the ball gets redrawn to 5 pixels down and right. However the ball is drawn from the previous iterations remain in the view. How do we make them go away? Any guesses? To get rid of the marks the ball leaves behind, we simply remove the background(255) from setup block, and paste it to be the very first line of the draw block. When our background code was in the setup block, it ran one time at the beginning, making our background white. But that isn’t enough, we need it to set our background to white on each loop to cover the balls drawn from the previous loops. Background being the first line means it runs first, it becomes the base layer. On each loop, our canvas is painted white, and new elements gets drawn on top of the white background. So we have no marks. That is the idea behind animating things in Processing, manipulating the objects’ coordinates programmatically to change their location. But how will we do fancy stuff, such as keeping the ball in the screen? Or maybe implementing gravity? I will teach how to do this stuff in next part of this article. We will learn by trying and building. We will learn how to do it and apply them to our game immediately. At the end, we will have a complete, playable, and hopefully fun game. You should be getting familiar with Processing by now. However if you stop here, all this knowledge will fly away. I strongly recommend you continue practicing, playing around with what you have learned. To help you practice, I will provide you with two exercises. You should try your best to do it on your own. If you get stuck, Google and Processing Reference should be your best friends. I will provide the code for the first one, but looking at them should be the last thing that you do. Remember the famous DVD screensaver which the DVD logo bounces around the screen and we all waited desperately for it to hit the corner? I want you to replicate that screensaver, but only using a rectangle instead of the DVD logo. When you start the app, the screen should be black and the rectangle should start at a random location. Each time the rectangle hits the corner, it should change its color (and obviously direction). When you move the mouse around, the rectangle should disappear and the background color should turn white (it is a screensaver, isn’t it?). I will not give the code for this exercise in this article. You should try your best to implement it, and the code will be provided in the second part of this article. The second part of the ultimate guide to Processing, a step-by-step tutorial to building a simple game, has been published. i need help on processing 3 language. please help me. Wonderfully succinct and easy to understand. Thank you kindly. Oguz is a software engineer and full-stack web developer, an expert in both back-end and front-end development. He has worked with a number of frameworks and tools. He always follows best practices in coding, providing clean, readable, organized, efficient, high-quality code. He's also a follower of modern technologies and techniques, which helps him decide the best method to build any project.